A rebellious Welsh girl runs away to find adventure, and travels with a grumpy talking bird to another world in the clouds. An adventurous young girl named Penwyn, running away from her worrisome dad on the coast of South Wales, stumbles across a talking Blue Footed Booby bird, going by the name Mister Booby, distraught his chicks are flying the nest. On the hunt for adventure, Penwyn follows him as he rushes off in search of his chicks to the mysterious and wonderful world of the clouds in this charming and heartfelt watercolour-animated story. Cumulus has been selected to be shown as the headline short film for the 'Best of British' category at Canterbury Anifest. Cumulus has been selected to open for the classic Studio Ghibli film, Kiki's Delivery Service, at Abercon, for the BAFTA Cymru qualifying WOW Film Festival's very own comicon convention. Cumulus has been selected for the BAFTA Cymru qualifying festival in Llanelli. Ioan Holland is a British Writer & Director with Cumulus being his debut animated film. Ioan has been a filmmaker for eight years and loves to imagine other worlds: combining original fantastical ideas with familiar life challenges. Spending his childhood summers visiting his grandma in Wales - or ‘Nain’ in Welsh - he has spent much time travelling across Europe, Asia, and Africa as a video producer. It’s this background combined with his passion for clouds and all things nature that have been the inspiration for Cumulus: imbuing the film with much of his Welsh heritage and sense of adventure and travel. Ioan pioneered and built from the ground-up the remote team operations for the production of Cumulus. A feat of modern technology, Cumulus was produced from all corners of the globe without an office and with most of the team having never met in real life, working from as far afield as the UK, the USA, and Brazil. What was the inspiration for Cumulus? As my debut animated film, Cumulus has been a labour of love from the beginning. Born out of an idea I had eight years ago that inspired me to begin working in film, it began with a deep interest in the atmosphere and clouds. There’s something uniquely wonderful about the skies above us that is a constant source of inspiration to me. I have long imagined another world in the clouds above, with analogous environments to those on Earth, like the Cumulus Forest our characters find themselves in: a world inside a classic cumulus cloud where the natural processes of updrafts of air and water are represented as trees trunks in a forest. I actually consulted with meteorologists in the creation of Cumulus to make the worlds and events as realistic and akin to real atmospheric processes as possible. Combine this with my love of great animated works from the likes of Studio Ghibli and Pixar, along with childhood favourites like Ivor the Engine and Wallace & Gromit, and creating Cumulus became a long-standing dream realised. Cumulus is about adventure and love, and that the two lie all around us in many guises, and that sometimes we're given a new perspective to reveal those things when they’re often hidden. The themes of the film deal with adventures of the outside world and the sometimes trickier and opposing adventures on the inside with our relationships with loved ones. It’s about balance of those different forms of adventure, growing, and seeing new and others’ perspectives that help us to appreciate the people we love. Why is the film set in Wales? I’m half-Welsh by blood and visited my grandmother in Cardiff with my family every year growing up. Feeling a great affinity with Welsh culture and language, much of the film is inspired by Wales. The film is set in the hardy and bracing environment of the Merthyr Mawr dune field on the south Welsh coast - just the right place to set an outdoor adventure in nature. The characters’ names help depict their character journeys in Welsh - Penwyn means fog (which she walks through to enter the Cumulus Forest), and her dad’s name, Bryder, means concern or worry, which is very much his character - while the harp in the soundtrack adds to the tapestry of Welsh heritage in Cumulus. What was special about the production process? Cumulus was produced remotely with a passionate team spread across the world and while I travelled across four continents. This means that most of us have never actually met in person and that we’ve worked from all corners of the globe without an office, and were able to produce a wonderful film with this workflow. The nature of the production meant that it was more important we had a talented and passionate team that would be happy to produce wonderful work on a very low crowdfunded budget of £2000, than what their geographical location was: and so our remote production was born. This allowed us to work with some really talented people with fantastic accolades, like our Lead Animator (Christine Kwon - Disney, Nickleodeon, and Warner Brothers Animation), our storyboard artist (Catherine Salkeld - Blue-Zoo Animation), and our voice actor for Mister Booby (Wayne Forester - The Magic Roundabout, Captain Scarlet, Horrid Henry). The remote model we pioneered to produce Cumulus also inspired a video production studio that now helps fund Cumulo Pictures. Why does the film have a watercolour style? I made it my goal to make Cumulus like a watercolour painting come to life. Working much with watercolour and inks growing up and later for an art foundation diploma, the tangibility of watercolour always intrigued me. For Cumulus we developed various new techniques to blend real watercolour with digitally painted watercolour to achieve an animated aesthetic that feels tangible - a paper-like touchable connection to the pictures on-screen - while also feeling alive and active, matching the organic nature of free-flowing watercolour paint with the natural environments and emotions we’re depicting. What was the process for the original soundtrack? The soundtrack to the film, composed by Aaron Buckley, was designed to remain aligned with the touchable simplicity of the watercolour visuals with a minimalist soundtrack comprised of just two instruments that represent the two main characters: the harp is the plucky and energetic Welsh Penwyn, and the piano is the heavier and grumpy Mister Booby. The two instruments come in and out and intertwine throughout the film to reflect the emotions, interactions, and arcs of our two main characters, in an effort to subtly enhance and communicate the emotions of the story. Cumulus is a British film with a Welsh heart, and was produced remotely with a passionate team that reached around the world. Most of the team have never met in person, working from all corners of the globe without an office. We have a team of people working from over the world: London, to Leeds, Bath, and Edinburgh in the UK, Los Angeles in the USA, Natal in Brazil, Hong Kong, and Cairns in Australia. Our Director, Ioan Holland, travelled around the world for video production work purposes during production, continuing to direct the film and meet with the team remotely every Sunday for three years when he was at home in the UK and while travelling across Portugal, Croatia, Thailand, Cambodia, Czech Republic, Vietnam, Morocco, Bulgaria, and Mexico. The nature of the production meant that it was more important we had a talented and passionate team that would be happy to produce wonderful work on a very low crowdfunded budget of £2000, than what their geographical location was. This allowed us to work with some really talented people with fantastic accolades - like our Lead Animator (Christine Kwon - Disney, Nickleodeon, and Warner Brothers Animation), our storyboard artist (Catherine Salkeld - Blue-Zoo Animation), and our voice actor for Mister Booby (Wayne Forester - The Magic Roundabout, Captain Scarlet, Horrid Henry) - and do amazing work regardless of location: proving you don’t need a big budget and a big office to do great work, that you can create film from anywhere in the world. The Director’s intention with the film was to make a watercolour painting come to life, and it’s with the experimentation of new techniques that combine real with digital watercolour that the look and feel of Cumulus came to be. By blending real watercolour with digitally painted watercolour, we hope to have achieved an animated aesthetic that feels both tangible and touchable like watercolour paper, while also feeling alive and active to drive the story forward. Real watercolour paintings were often used as starting points in backgrounds, and were developed into digitally painted backgrounds that used a mixture of blending and layering of digital elements, and real watercolour mixed in: creating a real and digital watercolour tapestry for the backgrounds in our film. A 2D digitally animated film, each frame of character animation in Cumulus was digitally drawn by hand, with a combination of digital and real watercolour bringing the character colours to life. 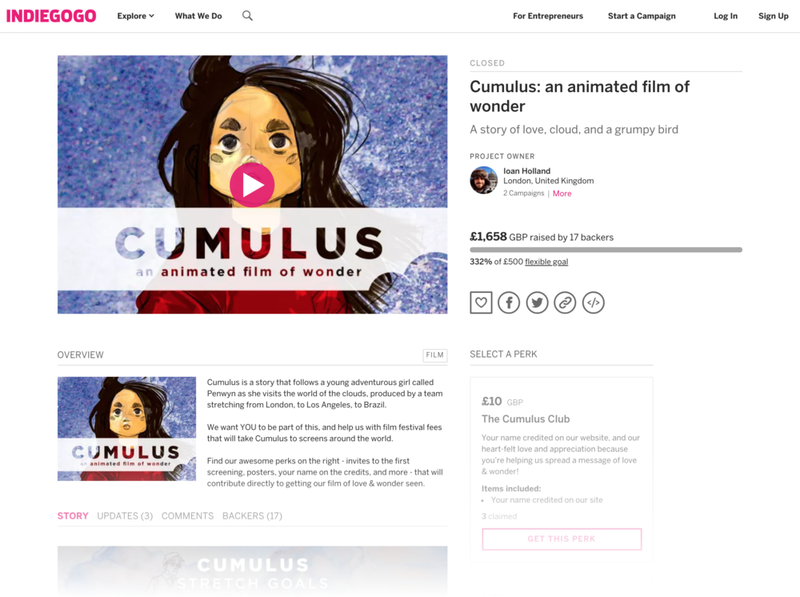 Cumulus has been funded solely by two crowdfunding campaigns with a total budget of only £2000, much of which has been reserved for film festival submission fees. The film was crowdfunded by people who loved the story and the artwork, and everything we achieved we did do with this tiny budget. Despite our very limited budget, we made it a policy to not allow any contributor to the production of Cumulus to go unpaid or work for free - so every single contributor was paid a fee for their work on Cumulus. We’re very proud of the amount we’ve achieved over a span of four years with such a small budget, which is testament what can be achieved with a dedicated and passionate team. The Cumulus team began when Ioan and Gloria met at London Waterloo railway station after Gloria had reviewed one of Ioan’s no-budget short films, and they realised their mutual ambition to create an animated film. Setting off to create their debut animated film, they grew a team at first with connections and researching talent emerging from universities up until the talent started coming to them as they reached out to their modest but loving social media following. The Cumulus team's credits include working with Disney, Nickleodeon, Warner Brothers Animation, The Archers on BBC Radio 4, and the new Captain Scarlet series. UK based, our team stretches around the globe - from the UK, to the USA, to Brazil, to Hong Kong, to Australia - with over 20 people working across five continents with an array of talents and experience in animation and film production. The Cumulus team has worked on the film as a labour of love, remaining dedicated over four years. With a passion for clouds and all things nature as the inspiration for Cumulus, Ioan loves to imagine other worlds: combining original fantastical ideas with familiar life challenges. Ioan has spent much time travelling across Europe, Asia, and Africa as a video producer and now runs a remote video production business inspired by the remote team operations for Cumulus. Gloria has been producing award-winning films and reviewing movies for six years. She took short film, Crossroads, to prestigious film festivals, such as Cannes, and won awards at festivals like Birdies Film Festival in London and the Long Island Film Festival in New York. Gloria's reviews are featured on official posters & DVDs of movies, including Studio Ghibili's The Tale of the Princess Kaguya. Based in the USA, Christine has worked with greats like Disney, Nickleodeon, and Warner Brothers Animation. A talented animator who has done work for local government, Paolo is based in Brazil. A talented Yorkshire-born artist in Edinburgh, Lija produces the beautiful backgrounds our animated world is built on. Assisting on Cumulus across the board, Cat is a storyboard artist at Blue-Zoo Animation and has had VR/360 film, Hoodoo, shown at festivals around the world. An illustrator and educator of various forms of artistry, Alison created the concept illustrations for Cumulus and the movie poster. Merle works with traditional illustration that reflects the natural world. She produced the concept backgrounds for the team to work from. Based in Cairns, Australia, Naomi is an established graphic designer that helped create the digital watercolour swatches for our characters. An accomplished voice actor, Wayne has been part of many big productions - including the modern remake of Captain Scarlet - and plays grumpy bird, Mister Booby. Rhian is playing excitable young adventurer, Penwyn, in Cumulus. Experienced in various acting disciplines, Rhian is in-tune with her Welsh heritage and brings the energy of Penwyn to life. Bryder, Penwyn's worrying Dad in Cumulus is played by up-and-coming voice actor, Philippe. Philippe is bringing his special brand of sensibilities to the character. Playing music since he was five years old, Aaron specialises in film soundtracks - and also composes for dance, theatre, and advertising - composing the score for Cumulus. A recent graduate from London College of Creative Media and working on the London electronic and experimental scene, Olly completed the mix of the Cumulus original soundtrack. 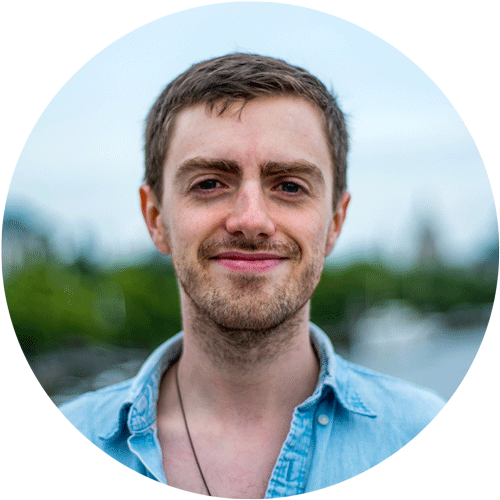 A passionate sound designer based in London, Owen designed the audio that helped bring Penwyn’s adventure to life. An accomplished sound designer, Andy works with BBC Radio 4 on The Archers and laid the groundwork for our soundscapes. Cerian, a London-based singer-songwriter and multi-instrumentalist, has worked with many great artists - including Radiohead, U2, and Sam Smith - and played the harp to provide a soundtrack to Penwyn's journey. Pianist and composer, Jools has worked on the soundtracks for many films - including Aardman Animations - and played the piano as the backdrop to the journey of Mister Booby.